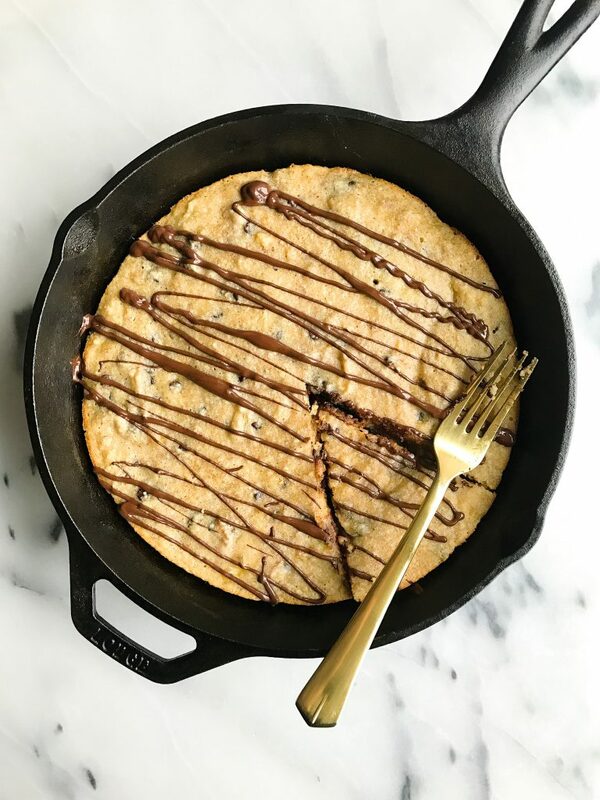 Chocolate Chunk Banana Bread Cookie Skillet made with almond flour for a grain & dairy-free dessert! Banana bread strikes again babes. Except this time it is even better (like I never even thought that was possible). 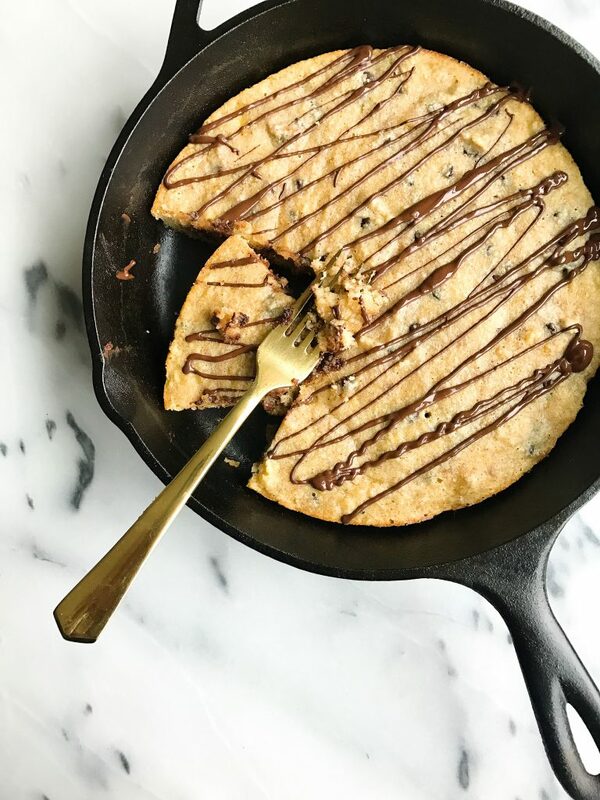 Banana bread is here in COOKIE SKILLET form you guys. We are combining two of life’s greatest gifts, banana bread + cookies into one grain-free, dairy-free and low sugar recipe. Yet I promise despite what I just said about all the “free’s” it still tastes absolutely dreamy. It is no surprise that I have a love affair with both banana bread’s and cookies as you can see on the blog. I am constantly craving one or the other and when I was doing my 21 day elimination diet (aka NO bananas) I was going threw serious withdrawals. Luckily when I reintroduced bananas, nothing bad happened. I felt great, had energy, and it was like a weight was lifted off my shoulders. Strawberries and nightshade though are a different story (will share more about this soon!). This was the first banana recipe I made and ate when I was reintroducing bananas again and I basically went b-a-n-a-n-a-s over it when I took my first slice. 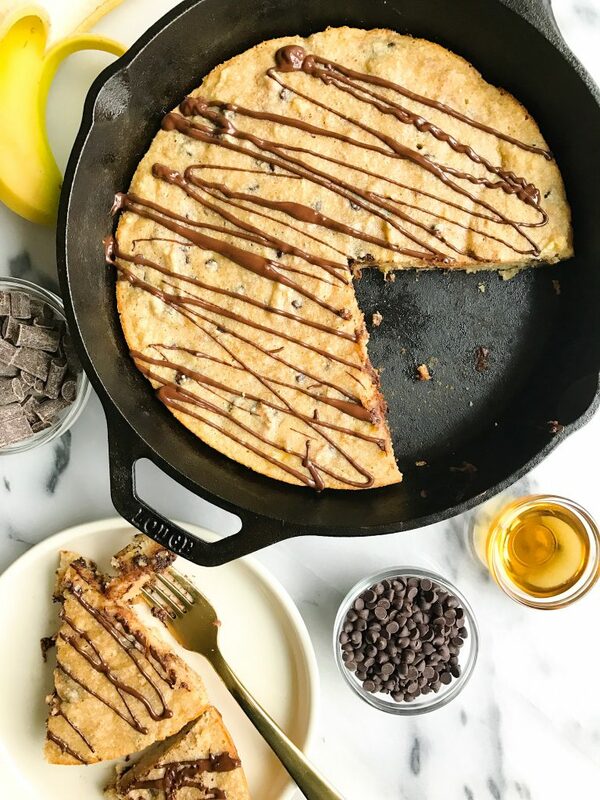 Just the right amount of sweetness in this banana bread cookie skillet and it isn’t overpowering banana-y. It is the perfect mix of banana meets cookie meets chocolate. Not to mention there are also three types of chocolate in this recipe all from Enjoy Life Foods. My staple allergy-friendly baking chocolate in the pantry. Also known as the bag I tend to graze handfuls from when visiting my pantry during the day. Those dark chocolate morsels and the mini chips know the way to my heart. What I love most about Enjoy Life Foods is what they stand for as a brand. Their products are free of gluten, peanuts, soy, casein, wheat, dairy, egg, potato and more. They are free of the “top 8 allergens”. All non-GMO and they make a variety of products in addition to baking chocolates like baking mixes, cookies, seed & nut mixes, and more. 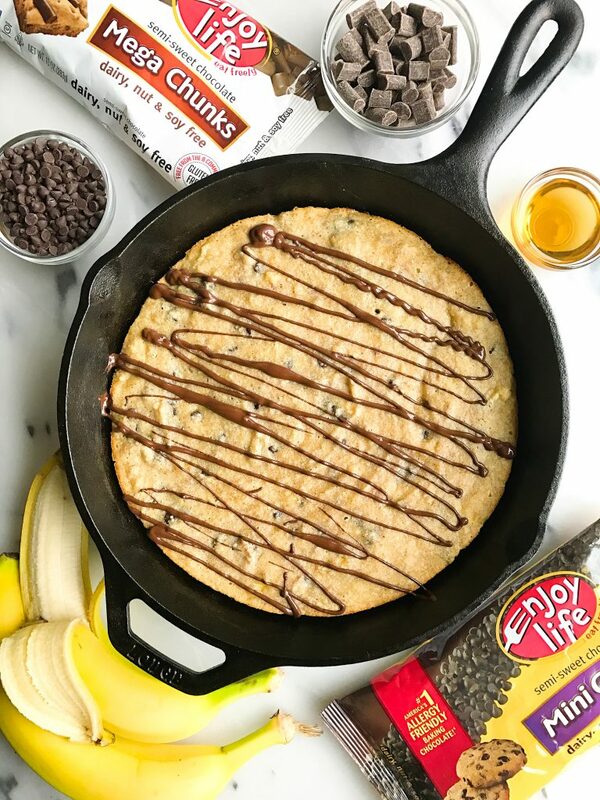 Enjoy Life Foods was one of the first brands I started buying when I began baking healthier recipes, and needless to say they have a warm place in my heart, always a spot in my pantry and most importantly a spot in this banana bread cookie skillet! I partnered with them for Celiac Awareness Month and am so excited for you guys to try this. *Will stay good for 5 days or you can freeze for longer! Thank you Enjoy Life Foods for sponsoring this post. It means so much to me to work with brands that I love and who support rachLmansfield! Ooooooh this sounds incredible! Mashed banana can really work some magic. Thanks for the recipe! I’m out of almond flour, can I substitute oat flour instead? If so, how much? Omg. Everyone needs to make this right now! Amazing recipe, I used 2 tablespoons of coconut sugar and one of maple syrup and it came out great! Awesome job with this one! if I only have larger skillet I mostly use for cooking meat is there another piece of dishware you think would work best for this? not tryna have meat-y banana bread and I really want to make this! anything works ! just eye ball timing. 8×8 baking dish etc. Do you think this would work with unsweetened applesauce in place of the coconut oil? thank you! i haven’t tested that but keep me posted! I made this last night and it turned out great! I subbed a 1/2C coconut flour for the almond flour and cooked it for 30 minutes. Thanks for the recipe! yummm! how could I incorporate pumpkin puree into this? can I do so without adjusting the other ingredients or time? I have made this recipe so many time and it always turns out perfect. Lately I have been leaving out the maple syrup and it is still plenty sweet! Love! This is legit the best recipe ever. I’m salivating over the second one I made this week. the best recipe on the blog!! I just made this with Bob’s red mill Paleo Baking Flour instead of straight up almond flour — turns out amazing!! Hands down best banana bread I’ve made. Thank you!! When you say good for 5 days do you mean in an air tight container on the counter or in the fridge? Can we sub the eggs? Would that work? I made this tonight and it was awesome! Best paleo banana bread recipe I’ve tried. It doesn’t have that spongy texture many paleo baked goods have. I can’t wait to try your other recipes! Hi! Ingredient list says baking powder, but directions say baking soda. Which one? Thank you! !